Showing 117 of 765 UltiPro ratings and reviews. Review: "Ultipro Helps Us to Care for our Customers"
Ultipro is being used across the organization for performance managment, compensation management, payroll, benefits including open enrollment and life events, and regular HR functions such as new hires and rate increases. Ultipro is particularly helpful on the performance management side. The set up and process is simple and is modiable enough to work for most organizations. Our main concern when choosing Ultipro was how it would be used by thousands of hourly, not necessarily system savvy employees. We have found that Ultipro simplifies it's processes so that it is easily understandable and therefore readily used. Customer Service is a strength for Ultipro. The model in place provides a personal touch and I am always amazed at how quickly our issues and questions get addressed. Ultipro listens to its' customers. We all have the opportunity to send in ideas and it is always gratifying when they are put into practice. Report Writing is an issue. It is not necessarily intuitive and with the recent upgrade has become more complicated especially for simple report writers. I was recently surprised at the pricing associated with the new Learning Management system. In comparison to other vendors it was way out of whack. Much too high. When tickets have to be escalated to customs or other areas beyond the basic customer support, it often gets lost in a "black hole" for too long. Well suited for companies, especially retail, who are looking for a system that is easy to teach, responsive, logical and lets your teams spend their time on their customers rather than on trying to figure out systems. Ultipro knows how to simplify processes very well. In addition, I have been "wowed" by their customer service. We have eliminated a ton or paper from using performance management and open enrollment. Our team members are comfortable working in the system and our processes have streamlined as a result. User Review: "Why I love UltiPro"
We currently use Core, payroll, benefits administration, salary planning, recruitment, platform configuration, time management, performance reviews, BI, import tool and we also use this as our intranet portal for our entire population. Using UltiPro helps us to reach the major population of our organization that does not have access to company emails or work computers. We do have 2 areas for them to access ultipro to enter their time off requests, manage their personal information and time. Same for management, they are able to manage their time and employee information. The reporting helps our management and finance areas for weekly, monthly, qrtly an annual reporting. UltiPro has helped us to streamline out processes and we are getting closer to a 1-stop shop which is wonderful for administering so many moving pieces. One thing that is extremely wonderful is that Ultimate knows that there is always room for improvement and listens to the customer. Each year we see improvements implemented that customers request. One area is the compensation module. Currently salary planning only goes to managers with their direct reports. The old module also had it go to the department head with his direct reports and their direct reports, which made it easier when you are using a pool. It would be nice to add that back into the module. It really is an easy product to use and the tools to help you along the way are great, which is needed since this is a virtual system. User Review: "UltiPro is the best!" UltiPro is used across the whole organization among three companies. We use it to manage benefits, payroll and our time management. Rapid Response hotline is outstanding for assisting with payroll critical issues. Through the Learning Center and Customer Support Portal there is a lot of information available to review and research. The FAQ the Ultimate provides greatly aid in launching new products such as the mobile app. Find the use of UltiPro very logical based and user friendly. Open Enrollment - would like to see the option to copy a previous year enrollment then able to modify for current year changes. Time consuming to recreate for each pay group. While promoting from within is great, we have encountered several account managers. Some better than others. So the turnover can be a bit frustrating. In UTM wish there was a method for administrator to make modification on behalf of the employee instead of only deny or approve. For our organization we find the HR and Payroll Processing features well suited for our environment. The reporting options are very beneficial for our needs. User Review: "UltiPro is wonderful!" UltiPro is being used organization-wide. We use payroll, recruitment, onboarding, life events, talent management and perceptions in addition to the basic core system. UltiPro has helped us go paperless by offering solutions in onboarding to provide new hire documents to applicants prior to their first day. They have also released a document acknowledgment feature that has eliminated the need to make hundreds of copies of items and track as they come in. The UltiPro system is easy to implement. We did it with two HR employees and had minimal IT involvement. The UltiPro reporting system is robust and you don't need to be an IT professional to use it. UltiPro's platform configure feature helps you make the system fit your company. While UltiPro offers a lot of wonderful training, it would be helpful to have access to checklists of the full process on items. For example, if you have to add a new location, we have submitted it before to our account manager, but it was never sent to taxes.....we assumed one ticket was the only thing needed. UltiPro can easily be used for all types of companies. It may be a little more robust for startup companies. We have already begun saving time with UltiPro. This year we plan on rolling out more features to our management team and empowering them with the management tools available. Our company utilizes UltiPro for all HRIS needs: Recruiting, Onboarding, HR, Payroll, Benefits, Time Management, and Performance Management. It is used across the organization for 900 employees. For us, the move to UltiPro presented an opportunity for a fully integrated HRIS that could manage employee data internally throughout the employee life cycle, and also integrate with external systems as needed. Customizable to suit the organization's unique needs. Very user-friendly for front-end users and back-end administrators. The existing Time Management module has many weaknesses, but these are all being addressed in a new version to be released soon. Service requests can occasionally take a long time to receive attention and be completed, depending on time of year. UltiPro has worked well for us starting at around 600 employees and now up to 900. The integration between modules has helped automate a lot of manual processes for us. It's a very powerful service that can be used in whatever way best suits the organization. I recommend having an HRIS expert on hand to really help achieve its full potential. All outcomes have been achieved for us. It's a good cost model for mid-market clients. Much time has been saved through automation of manual processes. All data is in one place and flows from piece to piece seamlessly. And we haven't had any security issues. UltiPro Review: "Payroll at its Best!" UltiPro is being used in both our payroll and human resources departments. We also have our employees using Time and Attendance for their PTO. Compared to our past payroll provider, we find processing of the payroll so much easier. The department managers found Time and Attendance was surprising very easy to adapt to. The employees really took to being able to view their accrual balances and request or cancel their own time off. To be able to reach out to the employees with company updates and news is very convenient. I would like to be able to view and/or print the pay stubs from any selected dates. This comes in handy when we need to know the salary paid for a period if it crosses into another year. The menu bar has everything at a glance. It now gives the options to select and save into my favorites. This is a great option. The reporting allows me to customize any report and save to run at any time. Since moving over to UltiPro [payroll] runs quickly and with ease for both the department and the employees. Review: "UltiPro is now my favorite Payroll & HR Platform, hands down!" Nov 2018 Update: I have used Ultipro now at two different organizations. One that used the Enterprise solution, and more recently another that used only Core. Ultipro continues to thrive by implementing innovative customer suggestions and implementing stellar upgrades with their Spring/Fall releases. I love that Ultimate Software is making Core more like BackOffice, in that Core is now able to handle a lot of the heavier things once possible only to experts and Ultipro account managers, all while providing the awesome customer support that Ulti is known for! April 2016: Ultimate Software's UltiPro is so simple to use, that I'm raving about it to my former colleagues! I've used other platforms for payroll, but UltiPro is by far the simplest to use. Did I mention that it's easy to use? 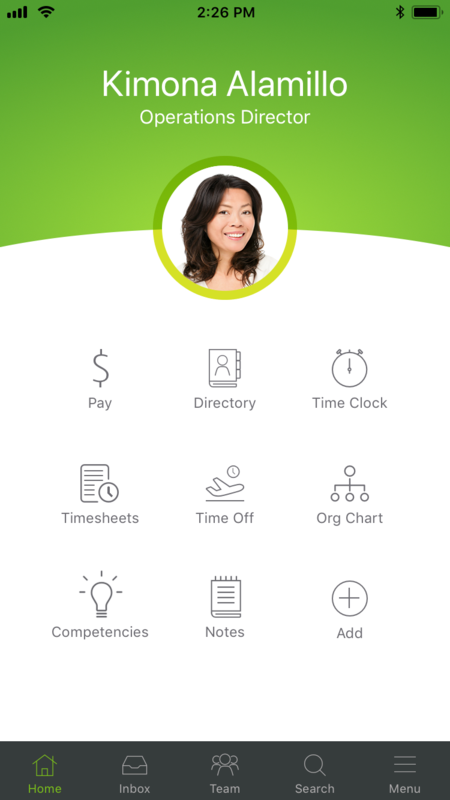 My organization uses UltiPro for Payroll and Benefits, for Onboarding and ad-hoc reporting, and uses Ultimate Software's Payment Services to file and pay our taxes and wage garnishments. I love that the product is web-based, accessible from anywhere, and that it really is very simple to navigate and to work with, that it seems as though it covers everything and anything that you can possibly think of. They truly listen to their customers, too. For instance, if you come up with an idea to improve the platform, you can share them with Ulti and they'll get right on it and if it makes sense, they implement it! Tax and wage statements, as well as the new 1095C reporting available online for all users. Quick processing of payroll, simple execution of benefits and open-enrollment, great reporting suite. Technical support and training available at all times. Online and on-site training available for all sorts of learning paths. Impactful integration of Ultipro with Cognos Business Intelligence. No cons. Absolutely the best HCM platform I've used! April 2016: UltiPro gets the job done! Not only can Human Resources use it for Onboarding and processing new hires, but all employee information flows so well into Payroll and benefits. It's easy to assign security roles based on multiple prompts and controls. The web-based platform is ideal for most, and it's "BackOffice" Citrix-based window portal is powerful as well, ideal for more advanced users. I'm well-versed in tax and unemployment, handling all state and federal reporting in-house, so it's great to see that UltiPro offers this service for those who might be overwhelmed with each state's monthly/quarterly reporting requirements, and they do a good job of working with you to ensure that all taxes are paid and reported on time. Ultipro really does allow organizations the ability to create time -- by this I mean when admins learn to use Ultipro to capacity, Ultipro has the ability to do things behind the scenes that give workers the opportunity to do more with their time. For instance, analysts and admins can use Business Intelligence reporting to find errors in collected data BEFORE there is a problem, cutting down on payroll processing errors and better benefits administration. And as of 2017, Ultimate Software's XANDER brings artificial intelligence to Ultipro, helping recruiters and managers make informed decisions based on millions of data points already housed in a customer's environment. And now Ultipro's ability to generate surveys also makes any organization well-informed on what employees favor or dislike about an infinity of topics that the employer wants to know about. UltiPro Review: "Get this NOW!!!!" UltiPro is used from Recruitment, through Onboarding, Core, Payroll, BI, and now starting Performance Management. Very easy to use the HR and Payroll functions. UltiPro is being used across the whole organization. UltiPro has become so handy for our company. We use UltiPro for everything payroll related. It's nice having one program that is very user friendly to access everything payroll related. From completing time sheets, to getting benefits selected to running important reports, UltiPro is amazing. Keeping track of time worked in the time management tab. This is a huge plus to make sure our employees are being paid correctly. Selecting benefits. This program allows our employees an easy and fast way to select and sign up for benefits with this company. Running reports. There are a number of reports that we can run to help us run better as a company. Reports including, payroll, benefits, employee birthdays, anniversaries, just to name a few. There have been a few glitches here and there but the Ultipro staff have been super helpful to get right on these issues and get them solved. Ultipro definitely saves time and helps me to know what employees in my company are doing as far as reviews, PTO, attendance. User Review: "UltiPro - is the Ultimate performer"
UltiPro is our core HRS and payroll system which all staff members access to view their biweekly pay stubs and update their personal information themselves. After they make changes the workflow for approvals kicks in and requires HR approval before being committed to their record. We moved to the web interface and SaaS configuration about 3 years ago to reduce down time and increase productivity because the quarterly and tax updates are done after hours eliminating downtime during business hours when I would have to do them my self. UltiPro has been extremely reliable with a total of no more than 30 minutes unplanned down time in the last 3 years which is extremely reliable. UltiPro continues to listen to customers and they work to implement our suggestions and are continually increasing functionality which makes our jobs more efficient and productive. I think they are the best HRS company out there they really care and are always striving to do more and be better at it. They have help reduce cost by allowing us to grow as a company from 450 employees to over 800 employees all with the same amount of HR staff and we have been able to reduce payroll to only 1 staff versus 2 staff previously. The predictive analytics help us identify high preformers at high risk for leaving so we can engage with them sooner which has help improve our retention rates. We are currently using UltiPro across the whole organization, however, it's mainly used in Human Resources. The business processes it addresses are reporting of data. With the robust standard reports and Business Intelligence feature we are able to extract more data with UltiPro and have more custom reporting abilities. Recruitment has allowed us the ability to move from paper to an electronic solution for searching candidates and hiring them. The file transfers allow us to communicate employee changes to vendors via a streamlined data flow for vendors. UltiPro's Business Intelligence feature allows users of the system to run robust reports, analyze the data, and create reports that suite their needs. One of the best features is the ability to email these to multiple individuals in the organziation with ease. UltiPro's platform configuration allows users to configure fields on pages that do not currently exist, control the access to already system delivered fields. This is a newer feature that is really cool for system administrators to use and have more flexibility within the system. UltiPros' payroll capabilites allow you to import data into payroll without extensive data entry, and the process is simple to follow. One of the features that I would like to see improved is the search capability within the employee page. Currently you are not able to search in the new window that pops up - you are only allowed to arrow between employees, which can take more time than a search or drop down list. I would like to see the Compensation Management module have the ability to base salary increase on anniversary date. This functionality would make it easier to administer pay. I would like the ability as a recruitment administrator to have the ability to see the Hiring Manager view. This is an area that is difficult to help users with when you are not able to have both Hiring Manager and Administrator roles. 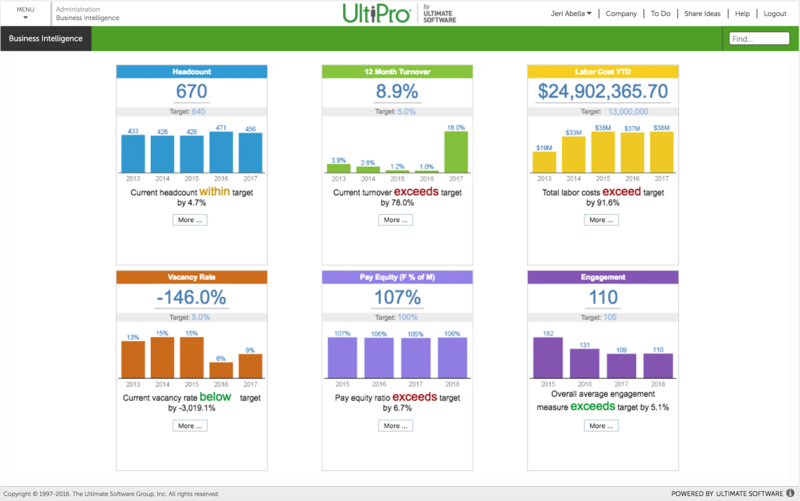 I really love UltiPro and the system offers great functionality for HR/Payroll professionals. I would recommend this system to anyone who is interested in UltiPro. Does UltiPro interface with other systems they use? What are the security capabilities? How does Ultimate store your data and what is the disaster recovery plan? We have been able to reduce the amount of paper used by encouraging employees to enter personal, tax, and pay information using the employee self service. In addition, we are currently in the process of online performance reviews and compensation. This will eliminate the need for paper and filing space will be freed up due to these changes. User Review: "Life got a little easier with UltiPro"
Luminex uses Ultipro across the whole organization. In North America it's our core HCM system from paying employee in the US & Canada, to enrolling in benefits to performance management. We continue to leverage Ultipro to our Global markets for HCM tracking, Performance Management and reporting. UltiPro has helped us standardize reporting needs globally. UltiPro gives us ownership of the system, from tables to security. It allows us to configure the system the way we need it to be. We have benefited greatly from the Open Enrollment solution UltiPro offers. It's allowed us to take a very manual process with multiple system entry and stream line it to a one stop shopping. Employee's complete their enrollment on line and their elections are then exported from UltiPro to our benefit partners. UltiPro's global workforce solution allows us to now have one point of access for our global markets data. We no longer have to take days to get a worldwide headcount report. We are very excited to continue to further grow our global functionality. UltiPro's puts their customers first and it shows with everyone you work with at UltiPro. It's a true partnership. Being a SaaS customer allows us to always be update to date and current with the latest functionality. Continue to develop the performance management functionality to include HR ability to reach out to users through email to keep the process flowing. Have the ability to change reporting structure when an supervisor leaves in the termination process. UltiPro is very easy to use at all levels of the workplace. Training is at your fingertips and your voice is always heard for enhancements. We have streamlined the HR Administration in North America (US & Canada), from perspective candidates (ATS), to successful offers and on-boarding to employees owning their personal data through self service. Open Enrollment has eliminated a very manual paper process and has given us 100% accuracy in our systems and our business providers. UltiPro: "Quick Review of a great product"
Our whole company uses UltiPro. We use it for recruitment, benefits enrollment/management, employee profile management, and talent management. Our employees use self service to update their name, address, telephone, emergency contacts, direct deposit and tax information. They use it to journal on goals and sign off on their reviews. Our managers create goals and complete reviews in the talent management. I really like Performance/Talent Management - it saves paper and makes the process more streamlined. I like that employees are able to log in and update thier own information thereby eliminating paper. I like open enrollment because employees are able to complete open enrollment thus eliminating paper. I would like to be able to configure notifications. I would like review templates specifically ratings to be more configurable. I wish the BI was easier to learn and use. If someone was interested in UltiPro I would ask them: "Do you have the time and energy to commit to learning the product and all it has to offer?" I wish I had that opportunity when I started to learn the system from the ground up. I just kind of jumped in and learned as I went along, I think that has made some things challenging. UltiPro Review: "Just implemented Payroll. HRIS only before"
We use Ultipro as a multi-state Payroll and global HRIS solution. Our implementation could have been smoother. Reporting tools are great. Payroll, once implemented, works great. We have gone almost 100% paperless since implementing Onboarding. We have also been able to schedule many data feeds and reports to allow for an automated approach. Ultipro is used in our organization as an HR tool for all staff. We use it to replace our employee files as well as use it for payroll, benefits, onboarding, reviews, and our employee directory. The fact that it has so many features and functions has allowed us to steadily increase our reliance on it as a one-stop-shop. We have now linked our Learning Management Software with the program so our staff has a single log in for HR and learning functions. The mobile app has significantly increased our employee's use of Ultipro. We have not found any issues as of yet. We began by using Ultipro for strictly HR functions but have now incorporated a lot more features. It is a great tool to link the employee to the organization and answer questions they may have without having to come to HR directly. Our employees like that they can correct their own details, such as address, and submit them for approval without having to fill out forms. Ultipro has given us a platform to standardize our employee documents and details for all offices and levels of organization. We love the ease of use and ability to customize the formatting so that everyone can understand. "Assistant Manager Review of UltiPro"
UltiPro is being used by our entire company. All employees use it for payroll and general personal information. I have a larger role in using UltiPro, so I also use it for recruiting and onboarding. We also use UltiPro to sign up for our benefits. Providing our employees with their payroll information at their fingertips, so they don't have to rely on someone else to provide this to them. Also having the lifetime pay history is nice. I love paperless W2s. I get my tax information much earlier than I would otherwise. It is very user friendly and easy to navigate. In recruitment, I would love to be able to hide older applications, or have the ticker for the amount of applications change once I have gone through them so I know how many new applications I have. When changing direct deposit information the only way to change from one bank account to another is to completely replace the old information. You cannot just add another account and delete the previous. Otherwise there is an issue with it not adding up to 100% (before approval). When looking at candidates that have applied to a requisition, it would be nice to have page navigation buttons at the top of the page as well as at the bottom. When an applicant updates their application it would be helpful if it would change their disposition back to "Applied" so it is more obvious that there has been a change to the application. 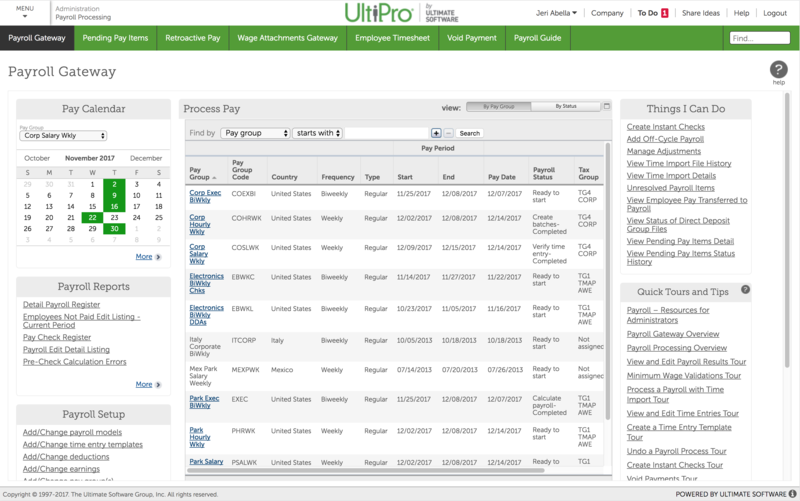 If you need to find any past pay information, then UltiPro is awesome. We just recently switched to the Onboarding portal to consolidate all the steps of the hiring process within Ultipro. I love that all the information populates into the other steps of onboarding. It is less for me to fill out personally when bringing a new employee on, which is a time saver for me. User Review: "UltiPro changed my payroll life!" UltiPro is currently being used by the HR and payroll departments. Our employees are also using it for self service options to update address information, view their pay statements and W-2s, as well as viewing their benefits information. We've also launched the performance management tools and are conducting performance reviews and compensation reviews within the application. Over the next 12 months, we'll be using the application to better communicate metric data to executive managers all the way down to our front line supervisors. Payroll processing - We have six pay groups and we can pick and choose which pay groups we'll run payroll for and which ones we're not quite ready to run yet. There is a great deal of configurability and flexibility when running the payroll. Since our launch of UltiPro in October, we've shortened the time it takes to run payroll from roughly 2 and a half days, to 1 day. The business intelligence reporting is amazing. It took approximately 2 weeks for us to learn, but after learning where the fields are located, the tool is great! The configurability of the application was one of the aspects that I liked best when going through the review process. When the salesperson tells you that the system is highly configurable, that is exactly what it means. Practically everything that I have looked at, I have been able to configure the page, fields or business rules to fit what I wanted to do. 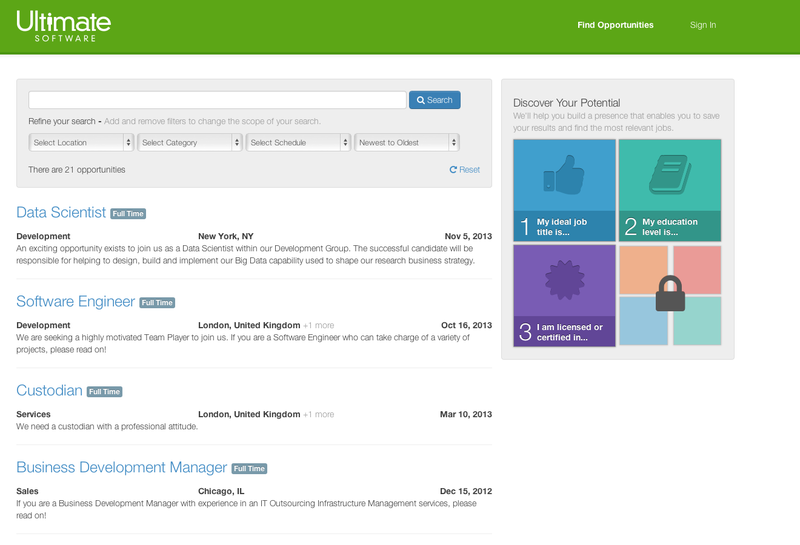 The talent management area is very easy to use and intuitive. Perception survey tool is incredibly insightful and has allowed us to better measure our employee's engagement. One area that I would consider UltiPro to be lacking is with their Time Management portal. While I feel that the tool is indepth and has a great deal of potential, the user interface can be confusing, both from an administrator and an end user standpoint. The reporting functionality is clunky and not nearly as intuitive as what is available in UltiPro core HR/Payroll. The tax, wage attachments and garnishments area is working its way back to being a strength, but they've had some significant challenges over the last 2 years. UltiPro is well suited for any employer, small or large. It has scalability and can be configured to fit any employer's needs. Where I would say it is less appropriate is if you need a slightly more robust recruiting system and you need some additional functionality around your talent acquisition process. We are continuing to utilize the tools available in UltiPro to achieve our goals, both from a people standpoint and an operations standpoint. The key focus today is to hold on to our employees and to better understand what their challenges are. We are working to address those challenges through the functionality in UltiPro and giving our employees access to those tools so they can be successful. UltiPro Review: "Great HRIS System"
UltiPro is our system of record for Benefits, Payroll and General Employee information. We primarily use it within the Human Resources department, but we are able to leverage data throughout the organization through API feeds and reports. Ease of use for managers and associates. Mobile compatible for our remote workforce that doesn't always have access to a computer. While most areas are mobile compatible, others are not. During the 4th quarter, support is always bogged down, resulting in longer than normal and sometimes unacceptable delays. Well suited for businesses of any size! By eliminating manual processes and letting UltiPro talk to other systems, we reduce the amount of time spent manually entering employee information and ensure that it's accurate. When someone leaves the organization, we are able to leverage the same API connections to terminate and remove access, so it is done timely and without fail. Review: "We're glad we made the switch to UltiPro!" UltiPro is currently being used by all company staff. It's a huge advantage to allow staff to update their personal information from anywhere in order to keep information current. Coordinators are able to initiate staff changes, job titles, pay changes, etc. easily and from anywhere to keep the process moving. We now use the goals feature of UltiPro to set and track goals for every employee. This helps to encourage ongoing discussions between the employee and their coordinator throughout the year. The PTO function has allowed us to track all PTO reasons easily and report them when needed. We've even been able to set up our Canadian and European staff to use the PTO and Goal tracking software. Reporting capabilities - UltiPro comes with over 300 standard reports already created, but we also have the ability to customize them and/or create our own custom reports to meet specific company needs. UltiPro staff take our suggestions seriously when it comes to improving reporting capabilities. ACA reporting - The accuracy of calculating data for our annual 1094 and 1095 ACA reports. UltiPro stays up to date on current laws and changes so that our reporting is correct. We were able to produce timely reports for our staff and the IRS without a lot of extra work. Community User Groups - The online community user groups offered by UltiPro users are very helpful. We get tips and advice from current users who've already worked through many of the issues that we are facing as a relatively new user. The network of UltiPro users is like one big family! UltiPro support - I'm very pleased with the quick responses I receive to cases that I submit. The support staff are very professional and knowledgeable about the particular cases they respond to. We have a dedicated team that specializes in each of the functions that we use. I would like to have the ability to project accrued PTO to a future date. I'd like to see a way to term all benefit deductions for an employee who is being termed from the company, without having to go into each benefit to select a term date. UltiPro is well suited in that all of our employee information is contained in one program, it is cloud based, and easily accessible by HR/Payroll staff as well as the employees. The app makes it easy to access personal information from anywhere. Employee access makes information readily available to employees applying for mortgages, loans, etc. I can't think of any situations where UltiPro would not be well suited to our business environment. Using UltiPro has given us a greater sense of security in the collection and reporting of data. We've added the coordinator workflows that allow staff changes to made using UltiPro instead of using paper forms and tracking down signatures. Everything is time and date stamped. We can easily review and track all requests entered in UltiPro. Our reporting capabilities continue to be enhanced as our proficiency improves in using them. User Review: "UltiPro Rocks the HR and Payroll Scene"
We use Ultipro across our organization. We are a very diverse holding company with hotels, a bank, an oil refinery and a large c-store presence. We implemented Ultipro about 4 years ago and our employees love it. They love the convenience of being able to access anywhere and being able to get information and answers themselves. It also addresses having all HR, Benefit and Payroll, plus company information in one easy to access place. We have over 6000 employees across 10 states, with turnover about 150% and Ultipro makes it easy to manage all things related to employees. I love the ease of accessing employee data. As an HR Professional, we are in UltiPro many times during a day and it is very easy to use and pleasing to the eye. Payroll is very easy with UltiPro. We are able to easily manage our numerous companies and their payrolls with a very small number of employees. The system is very user friendly and can import almost any type of time file. Thus adding flexibility to companies when converting. 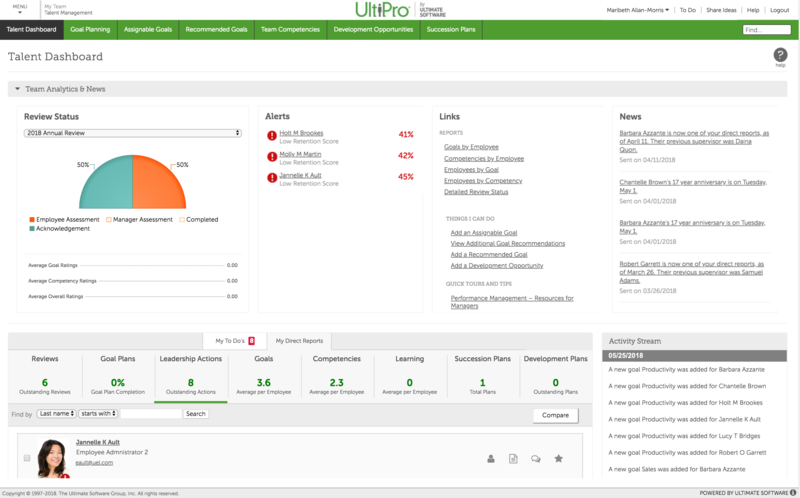 UltiPro has a very easy to use Performance Management module. It allows for reviews to be configured many different ways and they are easy for employees and managers to complete. This alone has saved a ton of time for our employees and managers. Ultipro provides great employee self service. Employees can do most tasks themselves, this relieving HR of providing many tasks employees can do themselves. Ultipro is large enough to handle even the biggest companies. It scales easily and doesn’t need a specialized programmer to do it. While every software has items that users may not like. UltiPro has some also. But the best part about UltiPro is that they are always taking customer feedback and improving the product. We had only been with UltiPro 6 months when they implemented 2 of our suggestions. I think this is the best part about UltiPro. All transitions to a new HRIS are a bit challenging. As I have converted 2 companies to Ultipro I have seen both. As long as your implementation team is dedicated and focused on the implementation it will go smooth. If you are one person doing the implementation, I urge you to get a team to help make it smoother. I have implemented UltiPro in 2 companies. One about 500 employees, and my current company with over 5000 employees. I found that it works equally well in both small and large companies. With my current organization, we have many locations, and UltiPro works well to keep our employees up to date and all information in an easy to navigate location. We have significantly increased our headcount and yet have maintained a very low payroll/benefit processor headcount. User Review: "Highly Recommend UltiPro"
Self-service. Their customer portal is extremely easy to use and provides an immense amount of training materials. I had zero experience with UltiPro when I first started my role and was able to utilize all of the materials on their website to become our company's SME. The user interface is unmatched. A person can jump right in even if they've never used it and start producing results. They provide great customer service. It's easy to submit cases and they follow up with you within 24 hours almost every time. We can also reach out to anyone on our support team and get help almost immediately. We'd like it if some basic features were more customizable without requiring an added cost or issues with new releases. For example, the items that show up on a confirmation page after a life event or open enrollment; if a benefit requires an expression, the cost does not calculate and appear. UltiPro is great for benefits! Having to collect and process people's benefits by hand is incredibly tedious, and having a system where employees and elect and make changes to their own benefits is a huge help, especially when it comes to Open Enrollment. We have absolutely achieved time savings by having UltiPro, and even more so when we get our Recruiting/Onboarding module. I currently have to enter each new employee's data manually, this module will save me so much time and human error. By having so many different modules, we can ensure the employee data is accurate across the board. No more worrying if we updated an employee's record in every system, when we can just do it once and know it's done. UltiPro Review: "The last software your company will ever need!" We use UltiPro to process in-house, weekly payroll for about 4,700 employees from 61 different locations (3 states.) This takes a 4 member team an average of 7 hours to do. Our entire population has access to the UltiPro portal where they can see their profile (which includes their taxes, benefits, paychecks, vacation and personnel time, rate of pay, etc.) They can access this from their computer or phone. My specialty field is benefits; I can tell you Ulti has been there from day one with the ACA compliance for part-time benefits. Over different areas we have looked for a 3rd party to administrate some things; but that didn't last long because Ulti has been there to provide us with what we need, so much so that we didn't have to send out to a 3rd party. Great customer service. Their employees have the patience of saints! Webinars/online support- if you need to review anything, you can go onto UltiPro web site and find it. They have step by step directions on how to do anything. They send information about upcoming Webinars that are every knowledgeable. Ulti always seems to know what's going on. If there have been changes to local taxes, compliance issues, state regulations on leave time, etc., they seem to know and have a plan to put into place. Report writing could always be made easier to use. Have the ability to archive somethings in employees records. For example, deductions that are no only in use. Their electronic benefits. As a benefits manager, I know this is an area that can use work in any system. I think Ulti is suited in all areas. Payroll, benefits, reporting, electronic files, Federal and State compliance. We have been with Ulti for 18 years. I can state that we have achieved all our goals with Ulti. But like anything else, we will have continuance growth and know that Ulti will be there with us. User Review: "UltiPro - the Ultimate experience!" Reeb Millwork uses UltiPro for Benefits and Payroll. We implemented Payroll and Core earlier this year and are in the midst of Benefits Open enrollment. It is used across all Reeb locations and departments, supported by Human Resources, Benefits, Recruiting, Payroll and Finance. UltiPro has enabled us to automate journal entries, develop monitoring reports to better manage our business, and provide a better user experience for our employees (combining several systems into one stop shop). We will be implementing the Recruiting portion as well, which will continue to help our internal staff processes, as well as reduce repetitive actions from potential Reeb employees. Direct Deposit is user friendly and automates a previously manual process. IBM Cognos Reporting provides various standard reports, as well as the ability to customize and create dashboards to enable better management of HR and Payroll processes. UltiPro provides a singular location for employees to access and manage their information, including HR, Benefits and Payroll. UltiPro training on IBM Cognos Analytics could be more robust, but we joined at a time when they had just completed their implementation. Additional training modules have been added which should assist with this process is the future. UltiPro Live Training sessions could be provided more frequently. We had a short implementation period and found it challenging to attend the Live training sessions, which in my opinion were more beneficial than the recorded sessions (they are good, just found the Live sessions to be better). Great product, great functionality and great support during implementation. Review: "We would choose Ultipro again and again"
I am in the Payroll Dept. and we use it, as well as the HR Department. We recently had them do a complete assessment for us to give us a better idea of what additional products we were paying for and not using yet. We plan to implement several more of their products over the coming year. Currently our employees can view their personal information, pay stubs and W2's. We intend to open up employee self service soon. UltiPro provides the best customer service of any vendor I have done business with. They have a rapid response phone line for issues during our payroll processing which is extremely helpful during that time crunch. UltiPro offers lots of free training classes for all of their products. Many of them are virtual so very convenient for us. Ultipro has a convention annually that allows you to take additional classes, in addition to networking with lots of other customers that use their products. I honestly do not have any areas that come to mind. When there are things that need improvement, they have a place to submit change requests that other customers can vote on to get them implemented. Ultipro has been excellent in running our payrolls. We have over 2200 employees, two companies, 8 paygroups and we run about 12 payrolls per month. Our HR Department will begin using several Human Resource products that they provide, next year. We also intend to move to their time keeping products next year. UltiPro is being used in all levels of our organization and has allowed us to build scalable solutions that allowed us to implement employee self-service options. UltiPro allows you to tailor the system to fit your organization's needs. Their customer service is responsive. We recently implemented UltiPro Recruiting & Onboarding which has allowed us to drop our previous ATS platform and consolidate into one solution. 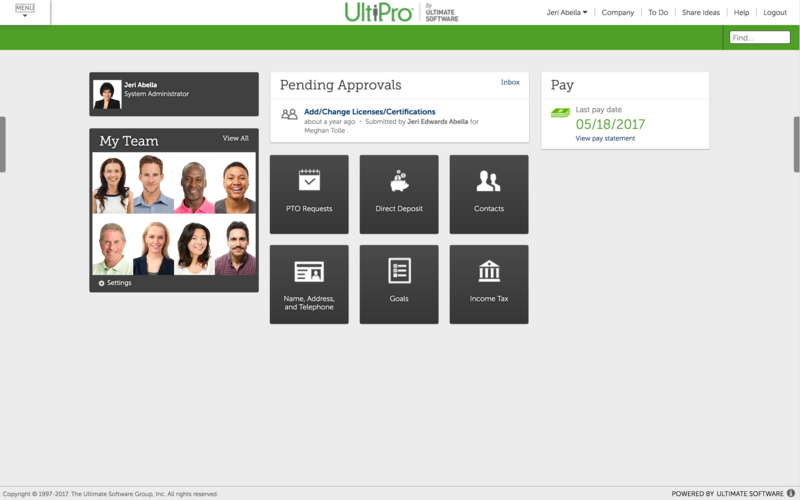 Ultimate Software’s UltiPro® cloud HR, payroll, and talent solution is designed with the goal of helping organizations improve the employee experience at all levels, beginning with personalized recruiting and onboarding and continuing with role-based access to pay, benefits, and development information. 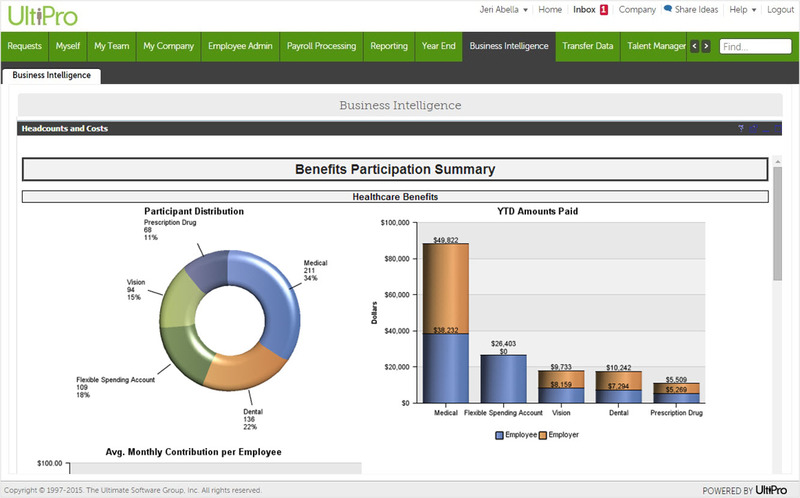 According to the vendor, the benefits of using UltiPro are that HR can rapidly process payroll; leverage flexible time solutions; offer a modern approach to learning; facilitate productive performance, succession, and compensation management; and measure employee sentiment using advanced survey technology (based on the vendor's acquisition of Kanjoya in 2016). UltiPro is supported by powerful business intelligence across all its solutions that aims to help organizations drive smarter, people-focused results. UltiPro provides organizations with visibility into their workforce. UltiPro improves strategic HCM for organizations.